The PC3 is an incredibly deep and complex instrument with many programming options. SoundEditor has been designed to make the programming and editing process as simple and easy to use as possible while providing all of the functional control needed to adjust every parameter. A few of SoundEditor’s editing windows are shown below. 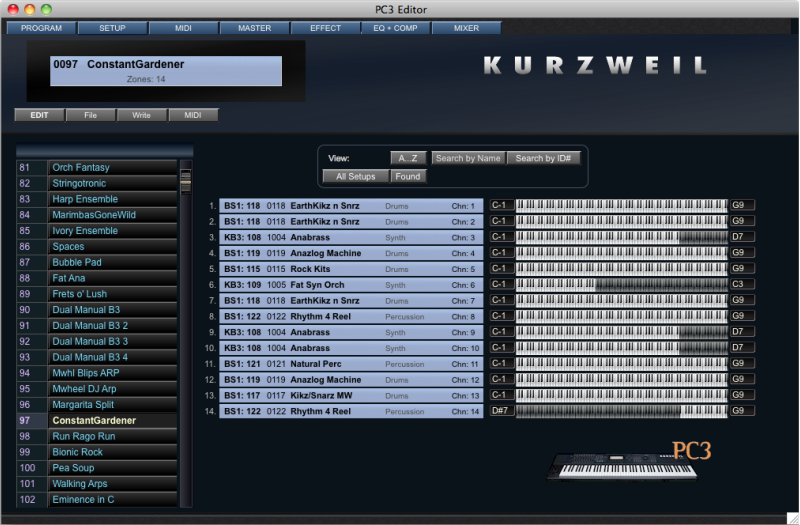 The PC3 standalone SoundEditor is available free of any charges for all Kurzweil PC3 keyboard users. 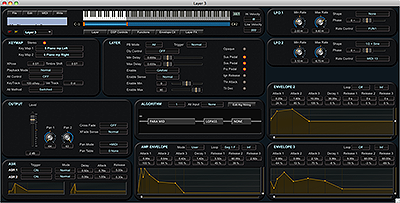 Current version of the standalone Sound Editor: 2.7.0 July 08, 2016. The PC3 SoundEditor is a full-featured Editor/Librarian and Sound Development tool for the Kurzweil PC3 series keyboard. While the PC3/PC3X is fully editable from its front panel controls, SoundEditor greatly expands the editing experience by displaying every PC3 parameter in a series of logical, easy-to-use graphical interfaces. 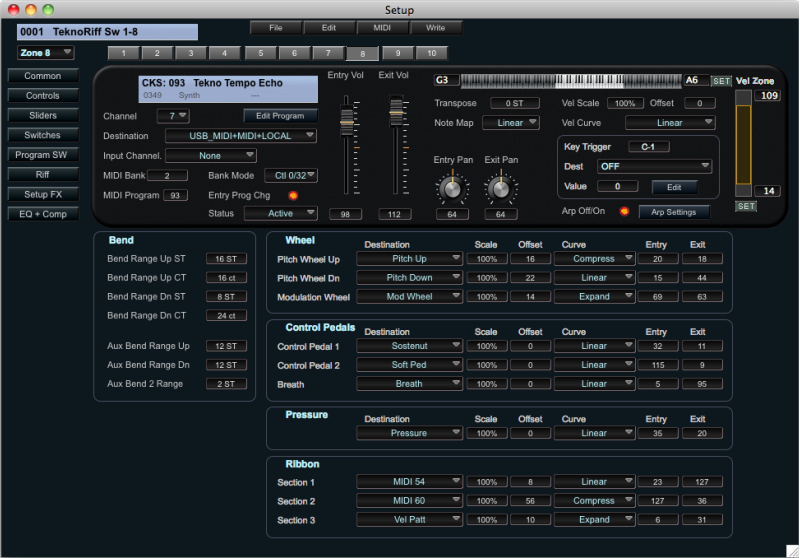 SoundEditor allows you to create, edit, organize, and store PC3 Programs, Setups, Songs and Effects. 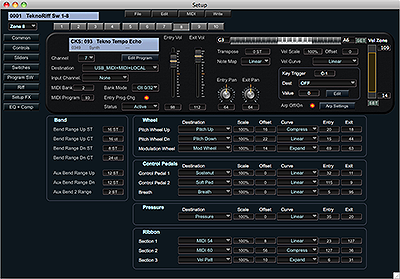 Through a standard MIDI connection (DIN or USB), SoundEditor can receive and transmit individual Programs, Setups or Effects, or entire banks to the PC3. All Program, Setup Effect and DSP parameters can be displayed and edited. Programs can be assigned to any of 20 Categories to assist in organizing, sorting and creating custom program banks. SoundEditor can also be used as a teaching tool to learn the inner details of the factory Programs. 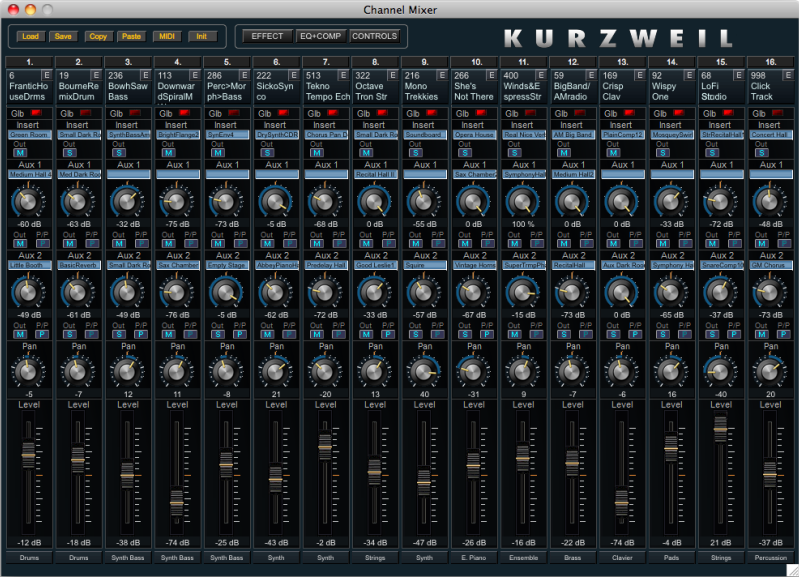 We hope you enjoy using SoundEditor for your Kurzweil PC3! Please note! 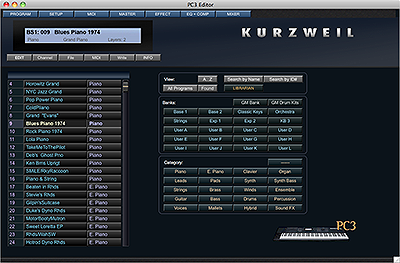 The editor is not a software instrument and it will produce no sounds unless connected with the Kurzweil PC3 series keyboard. The PC3 is a powerhouse of sound. There are 2560 user programmable Programs that are always available on 16 channels. Each Program can have up to 32 unique layers that can be spread over the keyboard range or particular keys. Layers can de added or imported from other Programs. Every Program Layer can have 2 stereo keymaps (multisamples) assigned and routed through different DSP algorithms and effects. 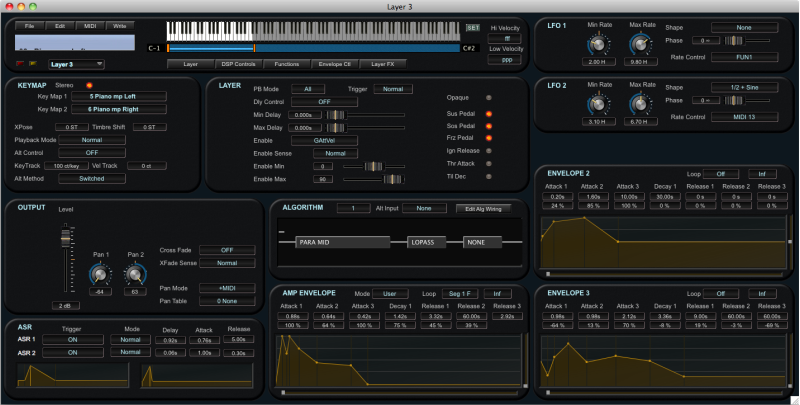 Layers have their own sound envelopes, LFOs, modulations and many other sound parameters. You can choose from 1024 Factory Algorithms and create another 1536 User Algorithms, all with different combination of blocks, input and output routings and DSP function selection. 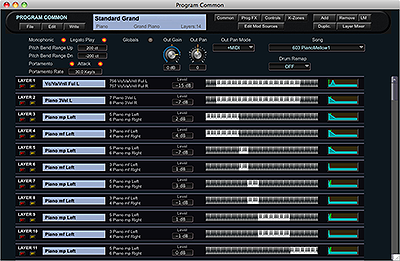 KB3 Programs are unique instruments with a capacity to create organs, pads and incredible lead sounds. 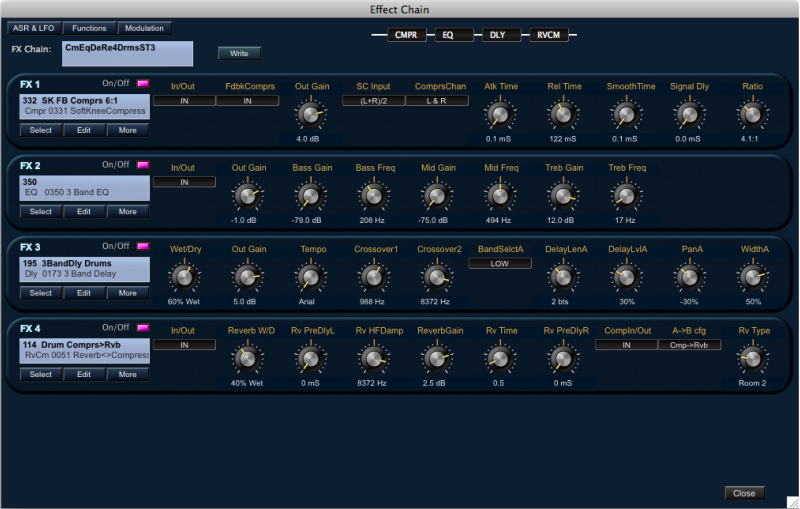 Effect chains are made of FX blocks that are linked together. 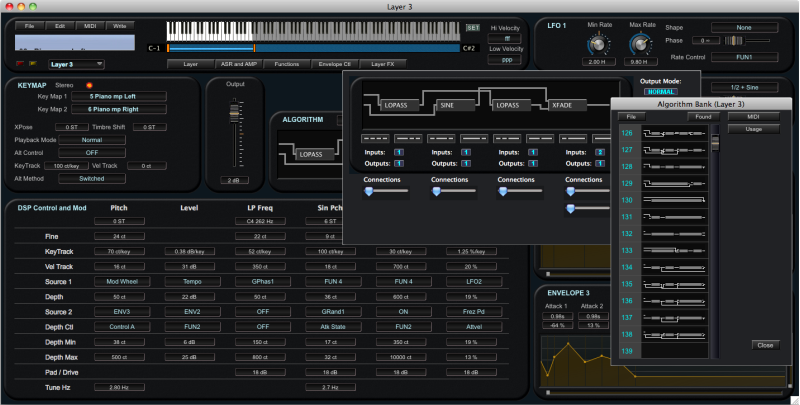 FX Chains have their own ASRs, LFO’s and Modulation sources that can be assigned to any FX parameters. There are about 1000 Factory preset FX Chains available with a space for 1560 more when you create them from scratch or modify existing ones. 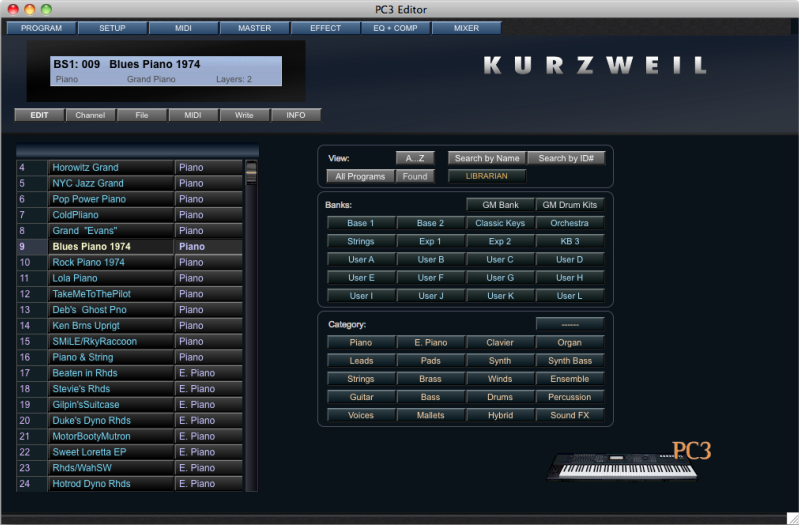 There are hundreds of unique famous Kurzweil Effects that can be assigned to a FX Chain box. 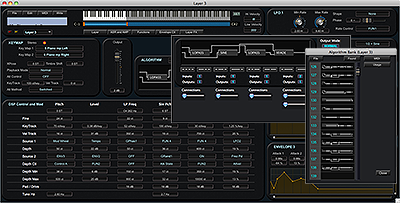 A Master FX window provides a global view and control of the effect assignments on all 16 MIDI channels. Each Setup can consist of up to 16 Programs with individual MIDI channel and control assignments. Programs can be added or imported from other Setups. Each Program in a Setup can be customized with unique entry and exit values for physical controllers, Pan and Volume messages, Program Change messages, MIDI Bank Select messages, etc. The Master EQ and Compressor provide global signal shaping control at the final stage of the PC3 signal path. 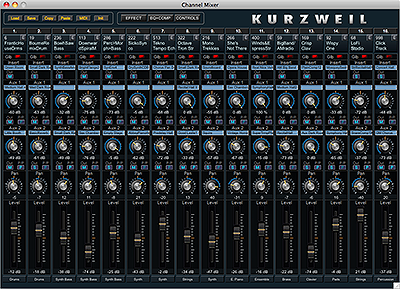 The Program Channel Mixer allows you to control Volume, Pan, FX, and other parameters for each Program assigned to the 16 MIDI channels. 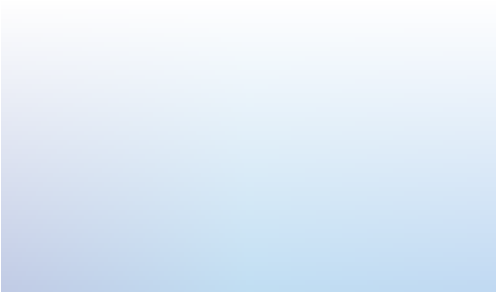 © 2016 Young Chang Co., Ltd.
Kurzweil and PC3 are trademarks of Young Chang Co., Ltd.